Welcome to our blog. Here we'll be discussing our experiences with 3D Printers, modifications we make, cool things we print, and probably some other technology discussions along the way. We started researching 3D Printers during the summer of 2012 and finally decided on a Mendel Max 1.5 variant as our first purchase. 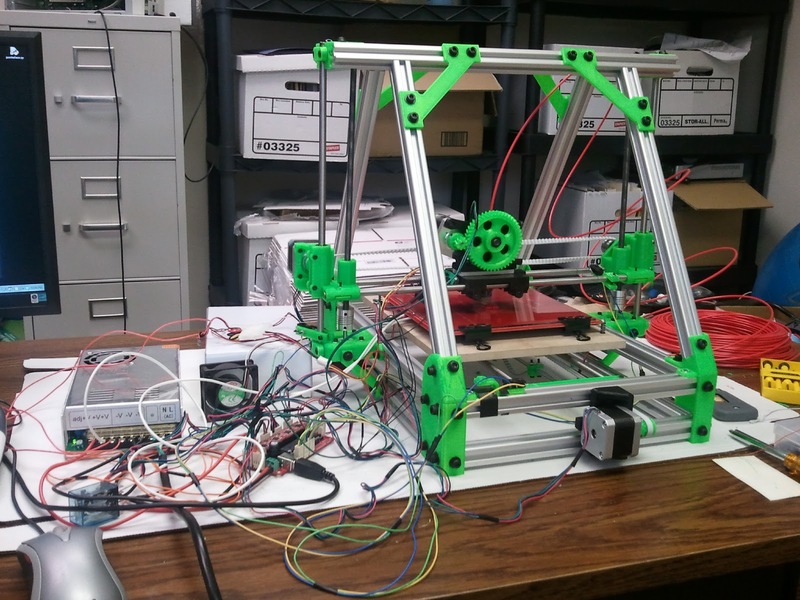 There's lots of 3D Printers out there, but we wanted something proven, easily customizable, relatively inexpensive, and we wanted the experience of building it ourselves. We received our printer kit in December 2012. It took around 20 hours to build the frame and connect the electronics and another week or so of tweaking the firmware and settings to get some quality prints and decent print speeds. 1) Some missing parts and screws. There was no way to trigger the Y-stop and no screws to mount the heat spreader. 2) Incorrectly drilled holes on the printer bed platform. This caused binding along the Y-axis rods and prevented the print bed from moving it's full potential along the Y-axis. 3) The print bed platform was too close the frame and once again limited the movement along the Y-axis. 4) Lots of Z wobble on one side. 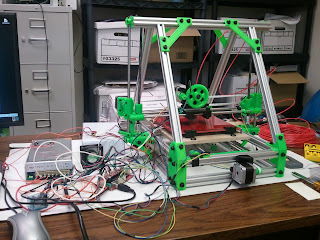 The assembled printer (messy). The only modifications at this point was mounting a 40mm fan onto the extruder assembly. One of our early cube test prints. Here's a print of a wall socket face plate. Running faster but still not at full speed yet.